The Bordeaux 2012 en primeur or ‘futures’ campaign has kicked off. Over the last month, wine merchants and press from around the world have been in Bordeaux for the annual tastings of young barrel samples, and opening prices for some of the leading wines have started to trickle out. I’ll follow up with my thoughts on the wines. 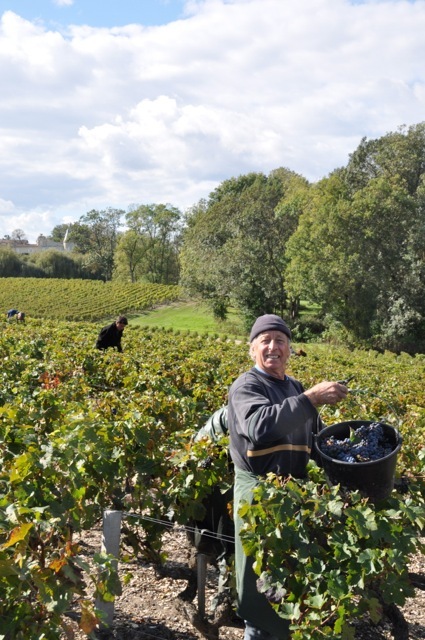 I wrote three 2012 harvest reports for Jancis’s site entitled ’Scorching summer but no rush’ last August, followed by ’The Late Show’ in October and lastly ’The end in sight at last’. Given these headlines, you’d be right in thinking that it was a late harvest. What was largely missing from those articles were some weather statistics, so here they are in a graphical format. After the two outstanding vintages of 2009 and 2010, it’s only normal that onlookers will compare 2012 with 2011. Yet the weather conditions in 2011 and 2012 could hardly have been more different, even if we like to slot two years into the same bracket of ’good but not great’. 1. 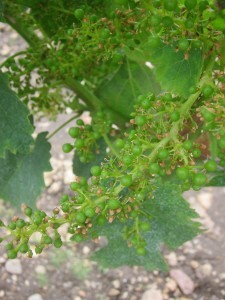 A late bud-burst and a wet April meant a slow start – the opposite of 2011. 2. Mildew was a real threat and had to be kept in check. 3. Mixed weather in June resulted in the flowering being drawn out. 4. 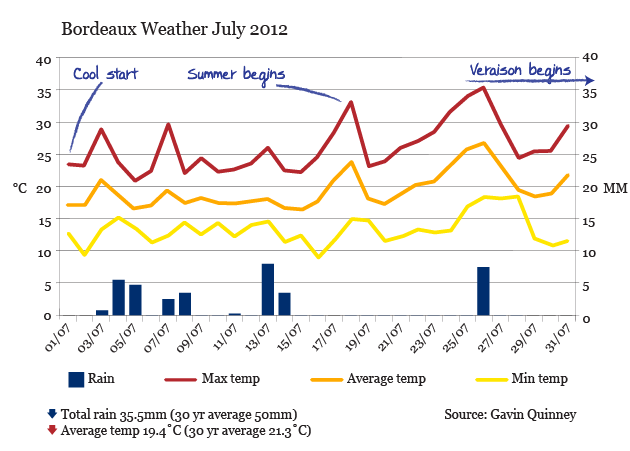 Bordeaux enjoyed an excellent summer from mid-July to late September. 5. 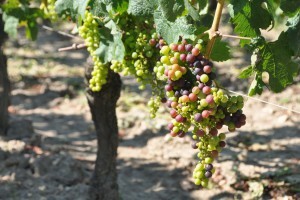 August was dry and hot but veraison (when grapes change colour) was spread out. 6. The dry whites were picked in fine September weather. 7. 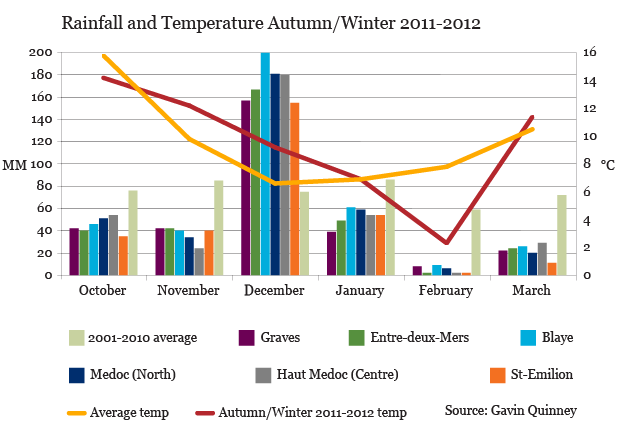 The weather changed towards the end of September, and October was up and down. 8. Humid, drizzly weather from 6 October ’encouraged’ many to pick. 9. Expensive grape-sorting machines earned their keep. 10. Sauternes had a challenging year, after three great vintages. 11. Yields were low but not as bad as other parts of France. 12. Quality is uneven and there should be some very good wines. The 2012 Spring bud break in the vineyard was much later than usual and a full three weeks later than 2011. Winter was mild until February and the vines didn’t shut down properly for their much needed winter rest until quite late. Then we had a bitterly cold February, much chillier than the norm, and the ground froze. It was to be some weeks before the ground warmed up and the vines came out of hibernation. We’d had three dry vintages on the trot (09, 10 and 11) and the winter of 2011-2012 was quite dry. There was a deficit in the amount of water (December being the exceptional month), with 336mm of rain here from October 2011 to March 2012, compared to 457mm as the Bordeaux average of the previous ten years. After very little rain in February and March, it bucketed down in April – 194mm compared to a 30-year norm of 78mm – and it was cold too (9.9C compared to 12.4C). Vine-growth crawled along at a snail’s pace and mildew soon became a huge threat. May, thankfully, was comparatively dry. 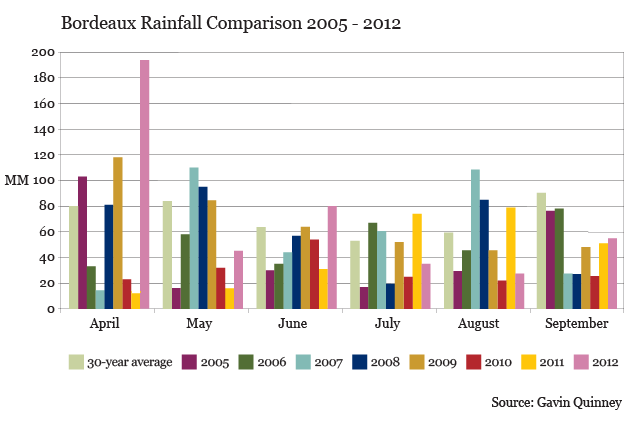 The extremes of the rain in 2012 are shown here, compared to the average each month. An April deluge, a little too much in June, a very dry summer and then rain again in the early autumn. The April deluge stands out (see comments above) but a key period was during the flowering in June. More on that anon. You can also see just how dry it was during July and especially August. This sets 2012 apart from years like 2006, 2007 and 2011. 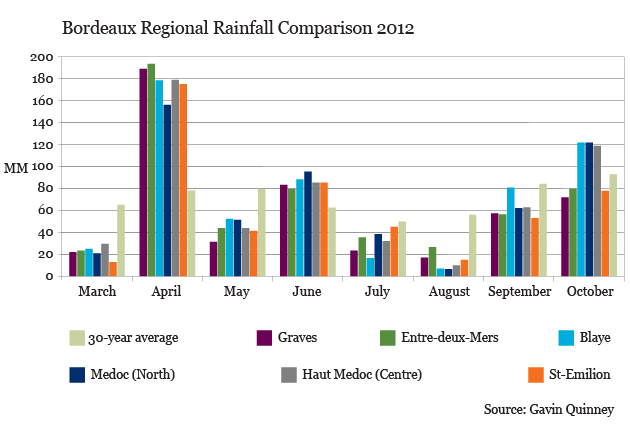 Here are the rainfall figures for the month (and the 30 year average in brackets). And the actual number of days of rain. April 194mm (78mm) over 24 days with rain. May 44 (79.8) over 8 days. June 79.6 (62.6) over 12 days, notably 2/6 and 9,10,11. July 35.5 (50), 8 days. August 26.5 (56) 7 days. September 56 (90) 7 days, notably 25/9 (see below). September rain was lower than the average and most of the rain came towards the end of the month (see below). Note: my figures are from my local weather station, some 15 miles south east of Bordeaux, except the ‘average’ figures quoted, which are for Bordeaux itself. April was not only very wet, but cold, accentuating the slow start to the growth of the vines. As you can see, August was pretty warm compared to recent vintages – as were the first three weeks of September – giving the grapes a chance to ripen. 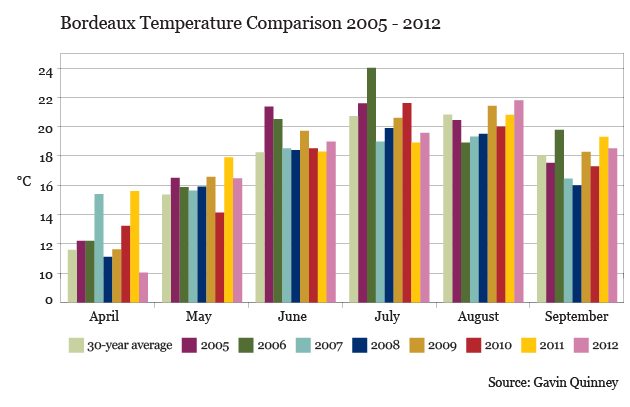 2011 had far more hours of sun in April, accelerating the early growth that year. However, 2012 had more sun than 2011 in each of the months of June, July, August and September, and this should be evident in the wines. 2012 compares very favourably to years like 2006, 2007 and 2011 from June to September, and isn’t far short of the top years. 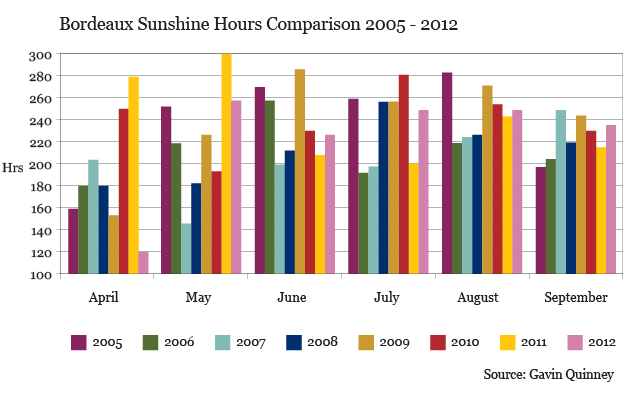 Note how the total hours of sunshine per month in the excellent years of 2005, 2009 and 2010 stack up, and how, for example, the weaker vintage of 2007 was saved by September. 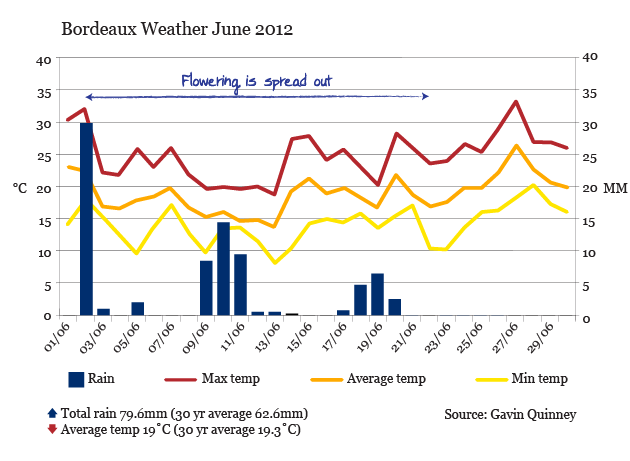 The rain in June (80mm here against an average of 62mm) fell on 12 days from 2 June to 20 June, and it was cold in the second week too – a critical moment of flowering. As a result, the floraison was drawn out and fruit set was uneven and inconsistent. Some vineyards were absolutely fine, although I have rarely seen bunches of grapes at such different stages of ripening – not just in different plots but from one vine to another, or even from one bunch to another. 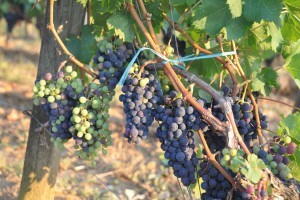 Many Merlot and Cabernet Sauvignon grapes were comparatively large but slightly fewer in number per bunch. One enologist friend reckoned it was because the vine was allowing for room for expansion in the event of rain late in the season. If true, this could have an impact on the quality and character of the wine. I love July here. There’s much to do in the vineyard, the French haven’t all buggered off on holiday just yet, and when we have some free time, the beaches and approach roads are relatively uncrowded. The weather too is usually fairly even, but in 2012 it was a game of two halves. Cool and damp at the start, sunny and dry later. As for the prospects for the vintage, the mood reflects the weather. After a protracted flowering in June, things were not looking good in the first ten days of July – but hope springs eternal as soon as the sun comes out and there’s a full two months before the harvest. August was quite cool at the beginning and at the end of the month (lowering the average temperature), but we had 12 days of 30˚C and over between 9 and 27 August, with minimal rain. Many vines, especially young ones, suffered from heat and water stress. The veraison for red grapes, when they change colour from green to magenta, was very drawn out across the month. This stemmed from the uneven flowering and, in some cases, from the heat or water stress. Well financed Chateaux sensibly removed green grapes towards the end of veraison. 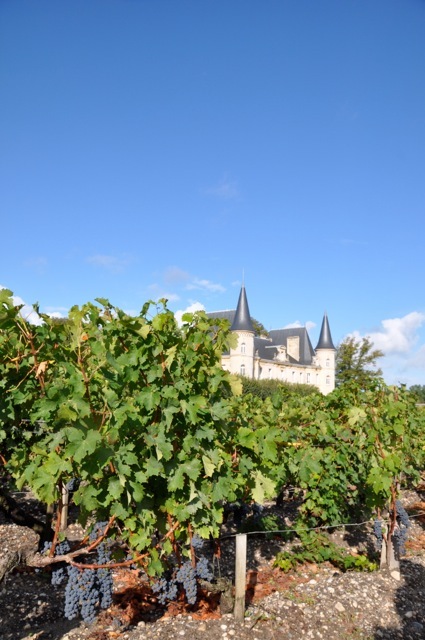 Chateau Cheval Blanc in St-Emilion, for example, had 40 people hastily ditching green bunches once the vineyard was at 90% of colour change towards the end of the month. After a hot and sunny August, the fine weather continued well into September. Sauvignon Blanc and then Sémillon were picked in excellent weather for the dry whites. The temperature dropped in the second week, which also proved helpful when harvesting the whites. 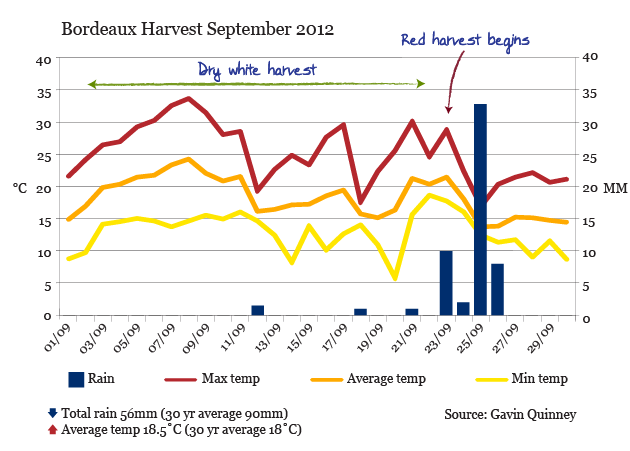 Dry white, however, makes up only a small percentage of the harvest in Bordeaux (less than 10%), so the real money was on the how the reds would ripen. 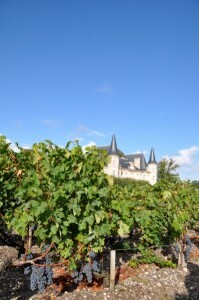 The weather turned on the weekend of 23 September, and a handful of estates began picking young Merlots that week. In 2011, almost all the reds had been brought in by the end of September but in 2012 very little had been picked to this point. It was a huge contrast, and a reminder of just how the weather controls the vintage. 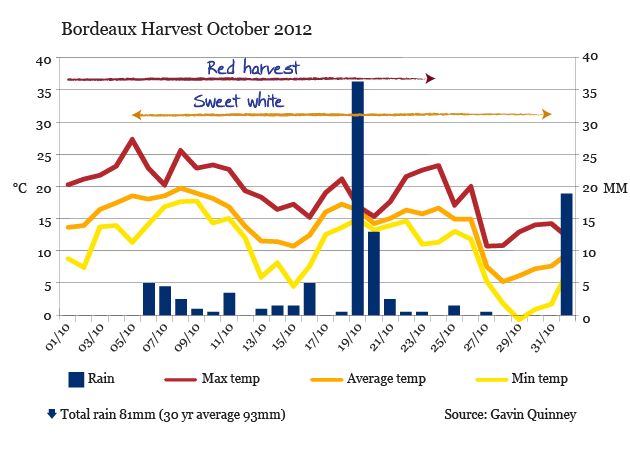 The red harvest began in earnest in the first week of October on both banks. Pomerol was largely completed by the end of the week, with the top estates of St-Emilion only kicking off from Monday 8 October. The weekend of 7 October proved to be a turning point, as it was both humid and drizzly, forcing many to bring forward their harvest plans in case rot took hold. Some had to compromise between harvesting healthy grapes and physiologically-ripe ones. Most estates had wrapped up the red harvest by the time of the heavier downpours on the 19 October. This would have favoured Merlot from the better terroirs over the later-ripening Cabernets. Having said that, all the Cabernet Sauvignon I saw being brought in on the Left Bank in mid-October looked in very healthy condition. The above rainfall figures from my local weather station. 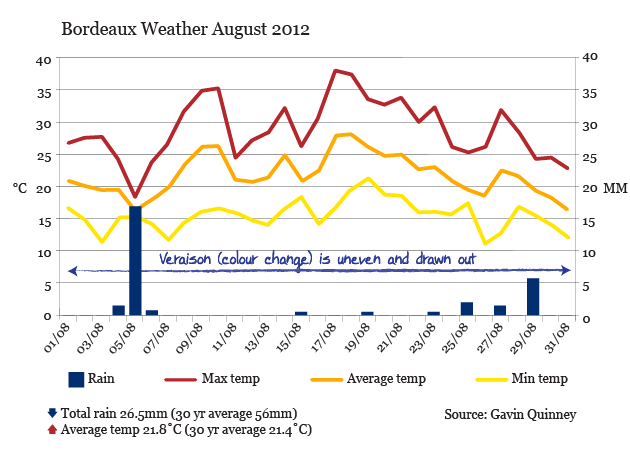 Rain in Pauillac, for example, was heavier than here around 14 October to 20 October. Personally, I think Bordeaux needed a fortnight of better weather at the end, but that’s always going to be the risk with a later harvest. It’s not that the grapes were unripe, it’s just a shame that after a marathon growing season and a fabulous summer in 2012, we limped across the finishing line. The opportunity to make outstanding wines across the board disappeared as Autumn closed in.